Output: 19.5V 4.62A 90W. Where possible a Dell rubber securing band for the wires is included, as shown in the pictures. Input: AC 100-240V, 50/60Hz. Power Cord Cable: UK Plug. 100% Original and Genuine. These AC Adapters are Genuine Original DELL. Venue 11 Pro (5130). Venue 11 Pro (7130). Dell P/Ns :KTCCJ ,80K6H, 77GR6, 450-ABNT. Venue 11 Pro (7139). Venue 11 Pro (7140). Power: 65W. POWER CORD is included where applicable. DC Output: 19.5V 3.34A. Plug Type: 3pin (UK). AC Input: 100~240V / 50-60HZ. 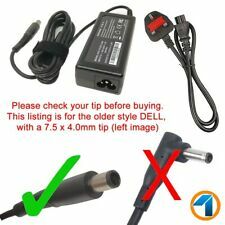 DELL 130W Laptop AC Adapter. Connector size: 7.4mm external x 5.0mm Internal, central pin. (Standard Dell round pin 'Smart' adapter.). Sold as the power adapter only (as pictured). A mains power cable is NOT included (requires standard 3 pin 'clover-leaf' IEC C5 power cable). Dell laptop power supply 19.6v 6.7A PA-4E . Condition is Used. Dispatched with Royal Mail 2nd Class. DELL PA-1650-06D3 PA-12 AC/DC. USED IN GOOD CONDITION HOWEVER. SORT OUT THE ISSUE STRAIGHT AWAY. AS IM WILLING TO 100% COMMUNICATE AND. IF OUT SIDE THE. UK MAINLAND ONLY. 01282 839 786. Dell P/N: JU012; MTMPN, CM161, 0CM161, WRHKW. - Output 19.5VDC @ 6.7A. - PA-4E Family. -Inspiron 17R (N7110), 15R (N5110), M511R (M5110), 17R (7720), 15 (7559), 15R (N5010), 7000. DELL PA-1650-05D2 PA-12 FAMILY. IF OUT SIDE THE. USED IN GOOD CONDITION HOWEVER. SORT OUT THE ISSUE STRAIGHT AWAY. AS IM WILLING TO 100% COMMUNICATE AND. UK MAINLAND ONLY. 01282 839 786. Dell part number vjch5. 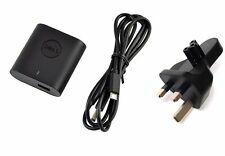 these are genuine Dell ac adapters not cheap imitations that are available. other compatible part numbers VJCH5 0VJCH5 MTMPN WRHK. Vostro 2510 3700 3750. Latitude E4200 E4300 E4310, E5400 E5410 E5430 E5520 E5530 E6220 E6230 E6320 E6330 E6400 E6400 ATG E6410 E6410 ATG E6430 E6430 ATG E6430S E6500 E6510 E6530 XT3. 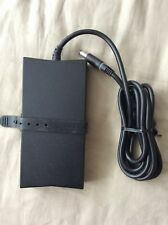 Dell Laptop Power Supply. Condition is New. Dispatched with Royal Mail 1st Class. DELL Optiplex Mains Power Supply Adapter D220P-01 FOR USFF 12V 18A . Condition is Used. Dispatched with Royal Mail 1st Class. Its rated at 950w maximum power. P5 - Floppy Drive 1 connector. its in full working order. p9 - SATA HDD connector. P8 - SATA HDD connector. P7 - Molex connector. P6 - Molex connector. Dell Inspiron 11 3000 Series 11-3147 11-3148 PA-1650-02D3 LA65NS2-01. Inspiron 13 (7347, 7348). Inspiron 14 (7437). 1 UK POWER CORD CABLE. 1X AC ADAPTER. ￭ AC Input: AC 100V - 240V 50-60Hz. ￭ DC Output: 19.5V 3.34A. Requires 3 prong mains lead. Dell Inspiron 1525 Dell Vostro A860. Dell Inspiron 1150 Dell Precision M20. Dell Inspiron 1401 Dell Precision M60. Dell Inspiron 505M Inspiron 1420. Dell Inspiron 1410 Dell Precision M65. Dell Inspiron 1420 Dell Precision M70. Tested and working fine Dell SX280 GX620 745 755 760 USFF. DELL Power Adaptor For Sale. ALL YOU GET IS THE ADAPTOR ITSELF, NOTHING ELSE INCLUDED. IV AB KW PA PH. P/N Y2515, P/N D3860, MK394. Dell AC/DC Adapters. ◆ Dell Latitude D610 Latitude D800. ◆ Dell Latitude D530 Latitude D610. ◆ Dell Latitude D531N Latitude D630. ◆ Dell Latitude D630 Latitude E4200. ◆ Dell Latitude D531 Latitude D620. ◆ D ell Latitude D620 Latitude D830. Dell Optiplex 390 Small Form Factor (SFF). Dell Optiplex 790 Small Form Factor (SFF). Dell Optiplex 990 Small Form Factor (SFF). Dell Optiplex 3010 Small Form Factor (SFF). Dell Optiplex 7010 Small Form Factor (SFF).